And you thought I was joking when I say they let me out of my cage. 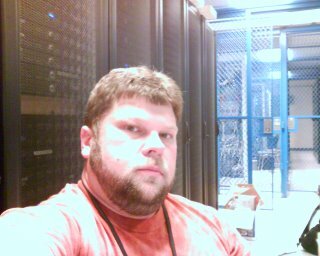 That is a secured cage in our data center; those are racks of servers behind me, my world. secured? do you need to have your retia and palm scanned before they let you in the bullet proof booth, which then measures your weight? fail any of the three and ya may get the gas if you're uncooperative .... ahh, i miss the DOE ... scares me! Use to work for DOI and DOD. It is not as secure as them but you do have to have someone let you into the building, then after the ID check you get your scan card, then you have to code and fingerprint through the door, then again for the computer room and then you have to have a key to access the cage. I would really like to meet you in person. We both seem to have a lot in common. I also thoroughly enjoy turkey hunting and roasting coffee beans. 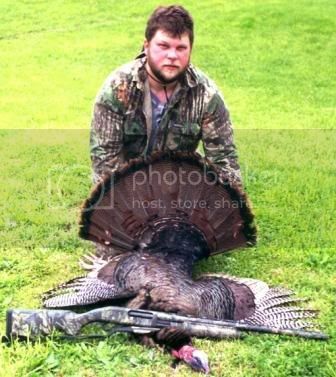 How big is that turkey that you seem to be showing off in your pic? How big of a load did you use to shoot that jake? 7 or 8 shot by chance? I prefer the bigger load if you see what I mean. I guess you appear like the perfect guy to me. I feel a little bit timid in writing this. This site is wonderful! See ya David!